Showing results for tags 'symphony'. This is the first movement of my third symphony, scored for orchestra. I'll upload the other movements when I have finished putting them on Musescore (they are on manuscript just now.) I hope you enjoy it. Hello everyone. It's a rough few months for me in a lot of ways, so this is really the first piece I have put up in a while. I don't often talk in the forum, as I usually just post. Anyway, here is my first, proper symphony, my Op. 41, and it is about my stay at Dublin last spring. I loved my time there, and I plan on returning soon. It is in four, semi-programmatic movements, and the whole piece is about 40 minutes. I really wanted to share it with everyone, so let me know your thoughts and criticisms, which I always appreciate. Thanks! This piece is made up mostly of old material that I came up with 5+ years ago but never did anything with. I have worked on this since mid-April. The title... I guess I probably shouldn't have called this a symphony, but I did anyway. This is an ode to college. For the past three years, I have attended Harrisburg Area Community College, majoring in Computer Networking Technology. I have had ups and downs, including countless moments of uncertainty and procrastination. I recall thinking several times, "Should I change my major?" and "Am I wasting my time?" In fact, right up until the end, I wasn't even sure if I was going to graduate at all. But I did. And so, this piece is intended to reflect my college experience. This piece is organized in a similar way to my other two "symphonies," and has the same instruments with the addition of a drumset. 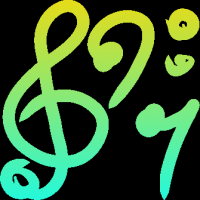 This piece was created in Musescore 2 using the Compifont Soundfont and the GeneralUser Soundfont. It lasts almost a half hour. The first movement is exuberant and jazzy. The second movement is panicky, uncertain, and contemplative. The third movement is recuperative and celebratory; it is also mostly the first movement backwards. I decided to post this as incomplete, because this only the first movement of hopefully three that will make up my second symphony. If this is incorrect, please feel free to move this to the proper location. The instruments are the same as my first symphony: Vibraphone, Marimba, Crash Cymbals, Cabasa, Piano, Celesta, String Synthesizer, Jazz Guitar, and Acoustic Bass. I placed emphasis on establishing a melody and then having it reappear later. The movement lasts about 5 minutes, and was written in Musescore 2 using the Compifont soundfont. Like my first one, in the mp3, there are popping sounds that I believe are caused by an issue with Musescore and the guitars. The movement starts off slow, and then becomes more upbeat as it goes on. So I started writing a third symphony, with the same instrumentation as the previous two. I remembered that I have a lot of unused material that I wrote years ago. Some of it is probably 5 years old or older at this point. I took two things that I wrote, and put them together to create what is intended to be the intro to Movement I. The originals, "composition" and "Symphony," are included below for reference (I imported the original MIDIs, and Musescore messed up the triplets). I took them and tried to improve upon them, including taking them out of the full orchestra zone and condensing them into the chamber orchestration. I wasn't comfortable with the full orchestra back then and I certainly am not now. Overall, the only thing I can say so far about it is that it is very repetitive. I guess that's just part of my style. I had more ideas, so I put them together and created a second symphony. The instruments are the same as my first symphony: Vibraphone, Marimba, Crash Cymbals, Cabasa, Piano, Celesta, String Synthesizer, Jazz Guitar, and Acoustic Bass. I placed emphasis on establishing a melody and then having it reappear later. The piece lasts about 20 minutes, double the length of my first symphony, and was written in Musescore 2 using the Compifont soundfont. I worked on it for about a week and a half. Like my first one, the entire piece is of original composition, unless I somehow copied existing melodies without realizing it. Also like my first one, in the mp3, there are popping sounds that I believe are caused by an issue with Musescore and the guitars. The first movement starts off slow, and then becomes more upbeat as it goes on. The second movement is austere and jazzy. The third movement, like my first symphony, is pretty much the first movement backwards with a few changes and additions here and there. This symphony serves as a sister to my first symphony, but it tells a different story. I feel like it also turned out sounding like the soundtrack to a video game. Indeed, there are parts inspired by the music of the Mario Golf series (especially Advance Tour), composed by Motoi Sakuraba. Other parts are made up of musical ideas that I've actually had for years. For example, the sixteenth notes in the first movement at measure 49 were inspired by a musical idea that I came up with more than ten years ago. I was at an amusement park we have here in Pennsylvania called Hersheypark, and I was in line to ride the ferris wheel. The ferris wheel machinery had this sort of hum to it that sounded to me like the notes C and G, and it stuck with me all these years later until I finally used it in a musical piece. In the end, I decided to kind of have fun with the instrumentation, and not really pay attention to whether or not it could be performed by a real orchestra. I’m writing some music for my friends. More on that in a bit. These little nuggets will one day become my first symphony. I guess wouldn’t exactly call them sketches since the music is written beginning to end, but they feel rough because they are not yet fully orchestrated. Either way, once that final orchestration phase is complete, this work will be a substantial piece of music, with a lot of rich content for the listener to explore. For now I’ve chosen a basic instrumentation of flute, oboe, trumpet, low strings. This can give a feel of being fleshed out, but is small enough to make sketching manageable, and colorful enough to make it fun. This instrumentation also helped me get away from the violin-centric symphony model, since I haven’t included violins in my original sketches. When I sit down and orchestrate this thing for real I will add violins in at my leisure, like a painter who, with one smooth movement, adds a bit of reflected light to a child’s eye. The next step is to dive deep into the orchestration and make some hard choices. But for now, I’m savoring the completion of an crucial leg of this artistic journey. This particular piece has taken years to get to this spot, and where it will eventually lead I am not entirely sure. Sometimes it’s just important to pause and recognize a milestone. The working title is “Homies”: Joe Soeller Evan Adventure Cat Erica Hunt-Shaw I’m not totally settled on all aspects of this music, but the overall arc I love. This is music for my friends. It’s a celebration of what we’ve all accomplished together, what we’ve built, the life we’ve lived, the love we’ve felt. The music goes a lot of different places, as do long friendships. For us the highs have been high, and there really haven’t been too many lows, and even if a low came along, we all know the high was coming back soon enough. Some of this music is an intense philosophical probing, difficult questions asked, journeys of personal growth, a connectivity that grows deep like tree roots, music for my brother. Another part is a long and exotic road trip adventure. Fences climbed, open mics pioneered, tequila bottles also pioneered. This is music to play spinbat to. And yet another section is a song of love, a private song, a hidden cave. When I dive back into this music and turn these nuggets into completed symphony movements, I may end up expanding certain chunks, or slowing down the tempo for a section, or taking the music in a slightly different direction if the mood strikes me. I’m still shaping the clay a bit. But the meaning behind the music will not change. It’s that meaning that underscores every note of this music, every rise and fall. It’s that meaning that drives me to complete it. I welcome any feedback. I confess that I'm not too familiar with the works of Amy Beach, but she's apparently among the first female American composers who wrote large-scale art music. I was struck by the lush, beautiful orchestration and harmony in the beginning of this movement (the rest of the movement is a pretty standard set of variations), and I wanted to share it. What do you think of it? hello everyone, this is an old piece I composed months ago, when I am free recently, I adjusted its sound effect in Cubase, hope you like it, and every commentation is welcomed. This is the piece I newly composed, hope everyone like it, and @Monarcheon welcome your commentation. This is the piece I newly composed, hope everyone like it and comment on it.